Jungle January – Nice dress! Thanks, I made it!! Again … I say better late than never! I managed to get my FIRST Jungle January – #junglejanuary5 – finished prior to the deadline, but my second animal print just wanted to fight with me. It is a lovely fabric – a cream, black and brown 100% Rayon Challis. Just beautiful to the touch. But as I was discussing it with Curls n Skirls I realized that it would be a perfect weight for a top, but perhaps not a perfect weight for a dress. It might need a lining. But then if I was planning to wear it in the warmer months – would I want lining? So I changed the plan … instead of making a dress, Vogue 9202, I would make a top, McCalls M6896. I’ve made the McCalls pattern before – it was my FIRST Jungle January – with good results. Of course the Vogue bodice pattern pieces were too short. They only reached to the pink line I drew on the McCalls bodice pattern pieces. So I would have to add an extension onto every Vogue bodice pattern piece. Jungle January and I made it just in time! Technically speaking, it is still Jungle January here. Hop on over to Pretty Grievances to see all the WILD garments that she has rounded up! In the last few waking hours of the day I would like to show you my second Jungle January garment – something that I am very happy with… even if I got off to a bad start. Let’s just say that I still haven’t learned the lesson: Read the instructions first! I have this pattern, Vogue V9107, which is not meant for knits, but who am I to follow the fabric recommendations! (Surprisingly enough, this time it worked!) I decided to make view A, the top. and I thank you, Pretty Grievances, for hosting this Adventure! 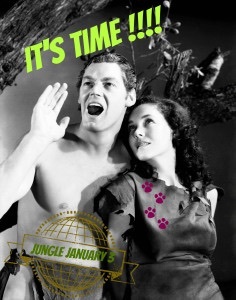 Pretty Grievances invites us all to join Jungle January so we can “add animal to our life”. I don’t think I have ever worn or even owned any Jungle prints. I almost thought I wouldn’t be able to bag anything before Jungle January was over! Animal prints are about as common in my wardrobe as PINK! but Pretty Grievances’ Challenge was very, very tempting.